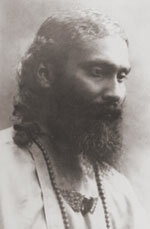 The prayers of the Sufi Order were written by Murshid Hazrat Inayat Khan to be recited daily. There is a set for the morning, for midday, for the evening, and some additional prayers. These are presented on the next pages organized into these four sets. You might wish to download a pamphlet in PDF format with the most important of these Prayers of the Sufi Order, available here from the Sufi Order of Toronto centre's website. We also offer a page of More Prayers and Blessings that are popular in the Sufi Order, but aren't necessarily from Pir-O-Murshid Hazrat Inayat Khan. Here are some tools that may be useful to people who are interested in these prayers. Memorization Aids - For those working to memorize the prayers. It is the tongue of flame that speaks the truth, not the tongue of flesh.